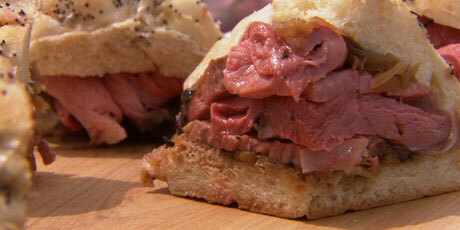 Juicy roasted beef, sliced thin and served with jus for dipping, makes for an out-of-this-world sandwich. 1. In a medium bowl, add all marinade ingredients (excluding the salt) and mix to combine. 2. Place the roast in a large sealable bag. Pour the marinade over the roast and toss to coat evenly. 3. Marinate the roast in the refrigerator for a minimum of 4-6 hours or overnight. 1. Once the roast has marinated, preheat barbeque to 325°F (160°C) leaving the middle burner turned off. 2. Remove roast from marinade and discard any excess. Season roast with salt and pepper and drizzle with olive oil. 3. Mount roast on rotisserie following manufactures instructions. 4. Pour all the dipping sauce ingredients into a drip pan. Place the drip pan over the grate with heat turned off. 5. Close barbeque lid and cook for 2 hours or 10-12 minutes per pound. Baste occasionally with the drippings in the drip pan. 6. Check the roast by inserting an instant read thermometer in the centre of the roast. For medium rare, the thermometer should read 125°F (51°C). 7. Remove roast and let rest, covered loosely with foil for 20 minutes. 8. Remove the drip pan using barbeque gloves. Strain the liquid into a small saucepan. 9. Place the saucepan over low heat and simmer for 5 minutes. Skim any excess fat or impurities off of the sauce as it simmers and discard. 10. Slice beef in thin slices across the grain. Serve on crusty bread with a small bowl of the warm jus for dipping.